Clown, pirate, or zombie? Bum? Burglar? Prisoner? No, these aren’t your career options. (Hopefully.) But if you’re going for any of these classic Halloween staples, you’ll need a base of black makeup to work your cosmetic magic on top of. And some costumes don’t need anything else! Wooly Willy, anyone? You decide with your palette of Black Base Makeup. It’s the perfect start to a million great costumes. There is one thing you shouldn’t do with this black face makeup. We don’t want to come out and say it. We feel like we shouldn’t have to! In this day and age, really. But some people need hard boundaries, apparently. We feel like you can probably guess what we’re talking about, but if you still can’t figure it out, just read over this again. You’ll figure it out. There you go. 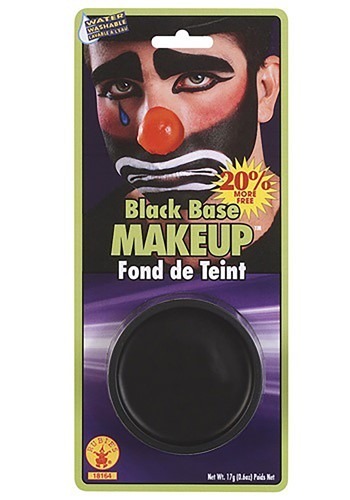 So, again, just to be clear, that’s the one thing you shouldn’t do with this black face makeup.